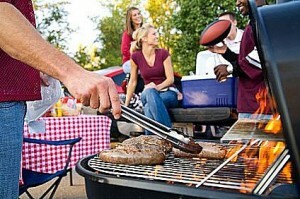 Sure, you can bring a car or an SUV to a tailgate, but then you are skimping on the tailgate part. To be a true tailgate warrior, you need a truck. If you don’t have one, borrow one or get a friend to bring theirs. Tailgating is fun regardless, but if you want the attention, and people wanting to head to your party, then you need a truck. It just breathes football and fun, and there is way more room to pack all of your supplies. If you’re going to waste time trying to tailgate out of your Civic, then don’t expect people to be raving about your partying genes. Liquor is great and all, but a tailgate is a marathon, not a sprint. You don’t need to look like the freshman sorority chick puking her brains out by the hubcap of a car at 9:30AM. Beer will cause you to gradually get drunk, and you can do way more with it. Funnels, drinking games, and passing them out is all more fun than with liquor. Not saying don’t bring liquor, but focus on the beer. Bring more than you could ever possibly drink. Beer is football, and beer is tailgating. If you want people to notice you, and head over to your tailgate, you are going to be needing to be packing some heat in the speaker category. Let everyone know you have arrived by boasting bigger speakers than what the stadium has, and cranking it up. You can get a full blown dance party going on in front of your tailgate, and girls are going to flock to the music. Express your dominance and make sure you bring the noise. Chances are, there are going to be friends of yours also at the tailgate trying to meet up with you. Instead of wasting time that you could be slamming beers trying to describe directions to your section and row over the phone, make sure you have an enormous flag waving high that is a landmark for everyone and anyone. People can easily spot you, and it shows off your pride. You are going to need something to soak up that booze, so don’t skip out on the grill. You can pick up a cheap disposable one at the store for a one time use, and buy some burgers and brats, and you’re good. Grilling and food is a staple of a football tailgate, and you don’t want to be the mooch that is asking other cars if they have any spare food. Sitting in a field or a concrete parking lot hours before the game is great, but you are going to need ways to keep yourself drinking. This is where drinking games come in. Make sure your tailgate has a long, folding table that is easily portable. This way you can incorporate everyone, and easily snag people passing by that want to be friends with the cool tailgate. Flip cup and beer pong are two great table games everyone knows and loves at a tailgate. Two more drinking games that are must have at any tailgate are bag toss and a beer funnel. Anyone that showed up to the tailgate late and needs to catch up on the beer count, can slam some quickly with the funnel. Also, during a tailgate adrenaline is high, and throttling beers is a great way to keep that going. Plus who doesn’t love to chug beers?! Bag toss is a tailgate must have, and getting a tournament going is a great way to spend your morning and afternoon.